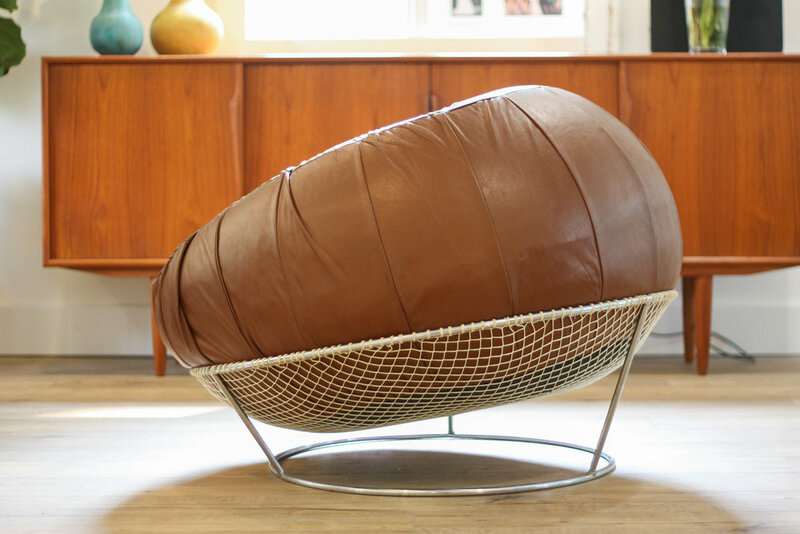 Feast your eyes on this beautiful Model MP-87 lounge chair by Brazilian designer Percival Lafer. This chair is incredibly rare and hard to come by, we believe this to be the only example for sale anywhere in the world. We are aware of one other MP-87 currently on exhibit in a modern museum in the chairs home country, Brazil. The buttery soft patinated cognac leather seat sits upon a chrome polished circular frame. The seat is suspended by the original nylon netting that is in excellent shape with no frays or breaks. The best description for this chair is like a perfectly worn baseball glove that hugs your body from all sides when you sit in it. We feel pretty confident in saying you wont have another opportunity to buy this chair anytime soon, go ahead and hit Google just to see how few examples of this chair exist.